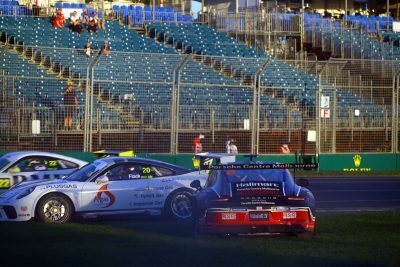 Dale Wood has notched up his second race win in Porsche Wilson Security Carrera Cup Australia after Nick McBride ran off the road at a restart. McBride had taken pole position and headed the field out of the opening corners but the race was quickly neutralised due to a start line shunt. Cameron Hill had stalled his 911 and was collected by Anthony Gilbertson, requiring the recovery of both cars from Walker Straight. Stephen Grove also pulled off with broken left-front steering after he turned around Max Twigg in a three-wide squeeze at Turn 1, having had Peter Major on his inside at turn-in. 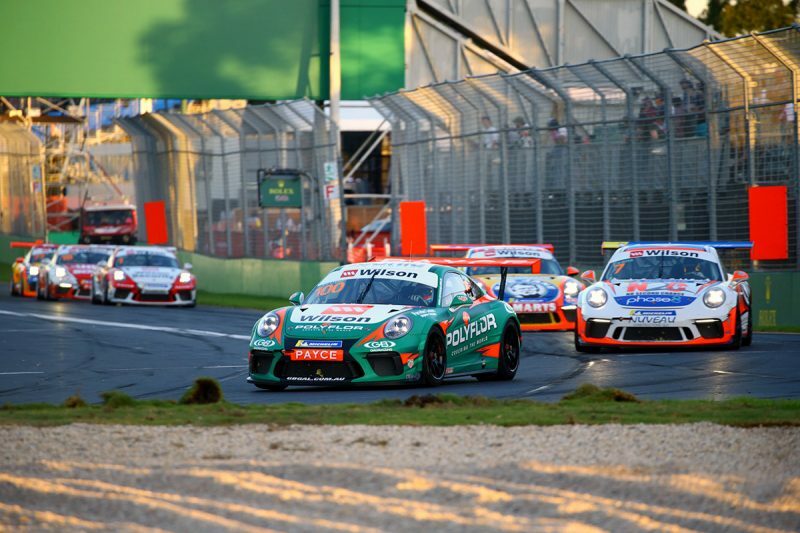 The race restarted on Lap 5, at which point McBride locked the rear brakes of the Porsche Centre Melbourne-prepared car and squirmed off the road at Turn 1. The mistake handed the lead to Wood, who himself had to catch an earlier slide exiting Turn 1 in the typically busy start to the race. Jaxon Evans passed Jordan Love for second before the first full lap of green flag racing was out but put himself under pressure when he too then nearly ran off at Turn 1. The moment temporarily gave Wood breathing space but Evans had gapped Love and caught the former Supercars driver a lap later. Wood broke into a big slide off Ascari on Lap 8 but managed to hold on for the two remaining laps to take the Race 1 victory, having done the same in Adelaide. Evans, who won the other two races in the South Australian capital, nevertheless extended his series lead by finishing in second position, nearly a second clear of Love. Defending champion David Wall and Tickford Racing co-driver James Moffat rounded out the top five. Alex Davison crossed the line in sixth position but could lose that after a coming-together with Michael Almond at Turn 3 on Lap 8. While Davison was a significant length down the inside of Almond before the contact which saw the latter spin, the corner had been covered by a local yellow for the beached Graham Williams. Almond eventually took the chequered flag in eighth, one position behind Dylan O’Keeffe, while Peter Major and Josh Hunt completed the top 10. Tag Heuer Pro-Am honours went to Roger Lago in 11th and McBride finished 15th having fallen as low as 20th after his off. The second of four, 10-lap races this weekend will be run tomorrow from 1455 local time/AEDT.